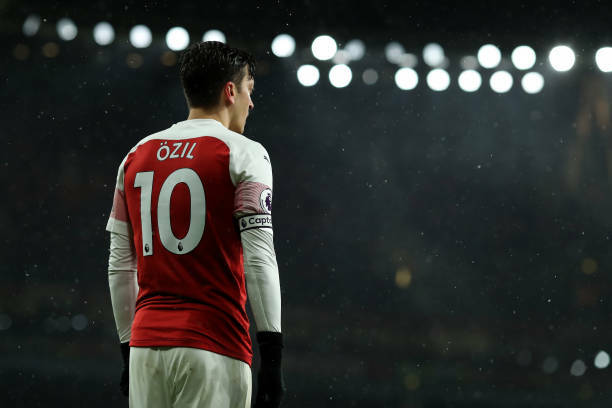 Both Mesut Ozil and Sead Kolasinac were in the starting eleven of Arsenal that beat Cardiff City 2-1 at the Emirates Stadium. Cardiff City made a visit to the Emirates Stadium on Tuesday to face Arsenal and the home side did no mistake as it scored twice to make sure that it collected all the three points. Sead Kolasinac and Mesut Ozil were in the starting eleven and they made great contributions to make sure their team gets the win. Mesut Ozil got replaced by Aaron Ramsey in the 76th minute and he watched the last minutes of the match on the bench. The German international has taken to Twitter to thank the Arsenal fans for their support. Sead Kolasinac was also selected in the starting eleven and it’s now fair to say that the Bosnian international has become Unai Emery’s first choice left back this season because of his performances. Kolasinac is sometimes not great at defending but the Arsenal fans will always love the good work he does on the flanks. Sead Kolasinac was very useful in Arsenal’s match against Cardiff City because he made a run into the opponent’s box, got fouled which earned Arsenal a much-needed penalty. Aubameyang didn’t waste the chance and he scored. That goal was precious because it gave them confidence to look for a second which they got through Alexandre Lacazette. He also sent a message to the fans.